The Productivity Add-ins Collection contains a collection of popular Excel Add-ins which enhances the productivity of data management and analysis in Excel. These have been bundled together here to offer more than 50% discount of the combined total price. Links are provided here to read more about each add-in or purchase individually. Duplication Management - This very handy add-in enhances productivity when managing lists in Excel. It is designed to assist when you have duplicates in 1 or more lists. You can create a list of unique values, hide all duplicates, create a summary report, color code all duplicates (up to 3 levels) and even prevent users from adding duplicates to a list or table. There is also the option to compare 2 lists for matching entries. 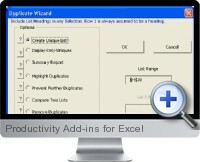 Formula Management - This Excel add-in is designed to enhance productivity when managing formulas in Excel. It can be used to map your spreadsheet by formula type. You can format the background color of all formulas that match the criteria you set. It a can also format the font of all formulas that match any criteria you set. Once applied, you can tell at a glance which cells contain formulas and which do not. Text Management - This Excel add-in is designed to enhance productivity when working with text in your Excel spreadsheets. It is particularly useful for text which has been imported into Excel. You specify the range to affect, this can be specified cells or the entire sheet. Functions include changing case, removing specified characters including spaces, and concatenation. Number Management - This add-in fills in the gaps in Excel when working with numbers. It allows you to add 15 different number formats that are not part of Excel's built in number formats. Retain leading zeros, show dollars and cents, align all decimals, put negatives in brackets, hide negatives, positives, zeros, text, numbers, or all. There is even a list box where you can select anyone of 172 currency codes to format your numbers with the code preceding the value. Name Management - This Excel Add-in will allow you to easily and quickly create and manage all Excel named ranges and constants. You can delete all redundant or broken names, create named constants, dynamic named ranges (ideal for charts and Pivot tables), create Worksheet level names, consecutive named ranges and more. Sheet Index Formula Reference Changer - This extremely handy Excel add-in will instantly change your formula references from Absolute to Relative and vice versa. Works on Selection, Active sheet or the entire Workbook. Dynamic Range Namer. This allows you to very quickly and easily create any one of eight different types of dynamic ranges that will expand down rows or across columns. You can even nominate the column or row to use as the criteria. It can also expand automatically each day month or week. Real Calendar. This creates a live calendar in an instant using real dates, so you can reference it if needed. The current day is always highlighted and updates automatically. Sheet Creator and Sorter. This option will create any number of pre-named worksheets which can be Financial Years (1901-2050), Weekdays (Monday-Sunday), Months (January-December), Years (1901-2050), Quarters (Quart 1 - Quart 4), Days (Day 1 - Day 1460) and Weeks (Week 1 - Week 208). It also has an option that allows you to Sort (ascending or descending) any Worksheets in any Workbook. A Random Number Generator. This can produce up to 1000 non repeating random numbers that meet a criterion you specify. Conditional Row Deletion. This saves many hours of repetitive work when you need to quickly and easily delete rows in a Worksheet that meet any criteria. There is an option that allows you to easily nominate any one of Excels six Error Types, or all of them. There is also a simple option that allows you to nominate the criteria. Duplication Report. This produces a statistical table of your data. Including a count of occurrences of each item, the total number of duplicates and a total of all entries. It will also produce a list of your data containing only unique entries. Better than a Pivot Table in a single click. Workbook Size Reducer - The File Size Reducer has become extremely popular as it can reduce Excel file sizes by 50% or more. This is ideal when emailing or sharing Excel workbooks.